ASABE 2018 Blue Ribbon Award! Who will benefit from Grain Drying, Handling, and Storage Handbook? 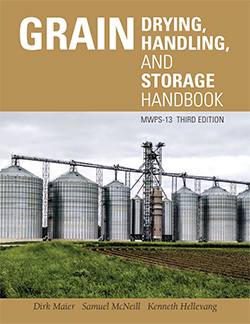 What will you learn from Grain Drying, Handling, and Storage Handbook? Whys and hows of developing a total system for grain drying, handling, and storage. If you are choosing on-farm storage for the right reasons. How design and location of a grain system can help avoid bottlenecks during harvest. Matching grain handling components to performance, capacity, and convenience. Function and operation of equipment used for holding wet grain, and also drying and cooling grain. Maintaining grain quality after harvest. How to handle larger grain volume. The need and importance of safety and automation. We want to acknowledge funding from the NC-213/Andersons Inc Research Grant Program administered by the Ohio State University which helped to make this new edition possible. Errata: Page 32. Caption for Figure 3-9 should be; Coring of the grain mass to remove fines in storage bins.